The film, based on a Bellevue author’s story, is no simple alien movie. "Arrival" rating: 3-and-a-half stars out of 4. So much of the pleasure of Denis Villeneuve’s poignant science-fiction drama “Arrival” lies in watching Amy Adams figure things out. She plays Dr. Louise Banks, a linguist recruited by the military to attempt communication with a mysterious spaceship, and we experience the movie through her perspective: a gasping, fearful wonder when first meeting the aliens (who look like enormous, wrinkled, seven-fingered hands), and a lit-up determination to decode what they are trying to communicate. The camera pauses, watching her as she watches them, realization dawning on her face like a sunrise. “Arrival,” based on the short story “Story of Your Life” by Bellevue-based author Ted Chiang, carries a tragic weight: Louise, as we learn in the film’s opening moments, had a beloved daughter who died young. We see brief, overlapping scenes from the child’s life: a beaming mother with an infant; playful moments in the backyard with a charming little girl; blue-lit scenes in a hospital bed, with a desperate mother whispering, “Come back to me.” When Louise finally agrees to join the expedition to Montana to meet the alien ship, you think she’s doing it because she needs something to distract herself from her quiet home, too filled with memories. And for a little while, you think this might be, simply, an alien movie. (Watch how Villeneuve plays with that idea; Adams, in the background of one scene, is transformed by shadows into a tiny-headed, stretched-out alien shape.) 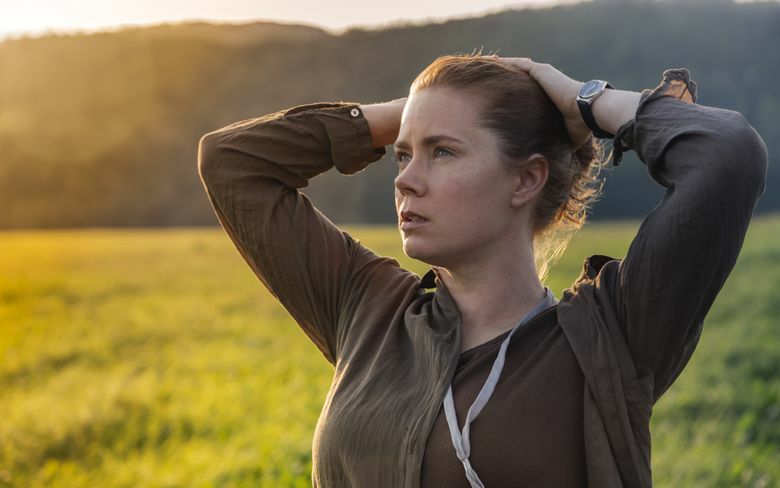 But things aren’t quite what they seem, and as we watch Louise gradually create a connection with the creatures (and with a wry scientist colleague, played by Jeremy Renner), “Arrival” becomes about something else: the idea of language as a bridge spanning time, and a reminder to us that we don’t write our own stories. ‘Arrival,’ with Amy Adams, Jeremy Renner, Forest Whittaker, Michael Stuhlbarg. Directed by Denis Villeneuve, from a screenplay by Eric Heisserer, based on the short story “Story of Your Life” by Ted Chiang. 116 minutes. Rated PG-13 for brief strong language. Several theaters. The aliens, communicating in vinelike spurts of smoke, remain an enigma in their half-egg-shaped spaceship, hanging eerily just above the ground. But Louise, through Adams’ soulful performance, is revealed to us. She is changed by these strange visitors, in ways that you’ll still be pondering after the movie’s final scenes. Seeking language, a linguist found an unexpected story. Through those strange, wordless visitors, she found home.